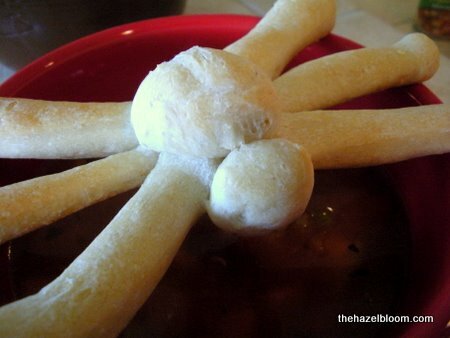 Turn ordinary refrigerated bread dough into a creepy fun dinner treat by shaping it into Spiderrific Rolls! I had so much fun playing with breadstick dough when I made witch’s finger breadsticks, that I thought I’d try my hand at something else. Something creepy, something crawly, something… arachnidy. How about spiderrific rolls?! So go forth and indulge your inner sculptor, gosh darnit! Make some Spiderrific Rolls! They’re are oh-so Halloween appropriate perched atop a big bowl of soup or chili. Note: Nothing to do with sushi. But I think that was already painfully clear. Roll out the breadsticks and cut each breadstick in half lengthwise - so one breadstick is now two skinnier breadsticks. Each spider takes four of the long skinny pieces. Cut piece one in half at about the 1/3 mark. Roll the bigger piece into a ball (this will be the body). Roll the smaller piece into a ball (this will be the head). Press the head onto the front of the body. Lay the remaining three long dough pieces over the top of the body. But really, this is the underside of the body, and as I'm sure you figured out long ago, these will be the legs. Yes, I know spiders have eight legs, but frankly, I don't want to be eating something that truly resembles a spider anatomically. I have an irrational fear of the real thing. Please, though, go further if you like. Go all eight! Pick the spider up carefully, and flip it over onto the cookie sheet so that where the legs stick on the underbelly is now facing down. Arrange the legs in a "spiderly" fashion. Bake at 350 for 10-12 minutes, until golden brown. These are so cute, and I’m tempted to give it a try. But……spiders. Because, you know…..GAH!!!! I love it – when I saw the title, I was expecting sushi rolls! I think you are on the road to a “fun bread ideas” cookbook or “fun with breadsticks” thought that might not convey the – uh – right idea! Sonia, too funny. Maybe we need to get a big group together for a night of Cranium! If Vicki is there, she may insist on telling you our Cranium story. It’s… very, very embarrassing.